A strong start to the season has officially landed the Aurora Tigers a spot in the Ontario Junior Hockey League’s big dance. 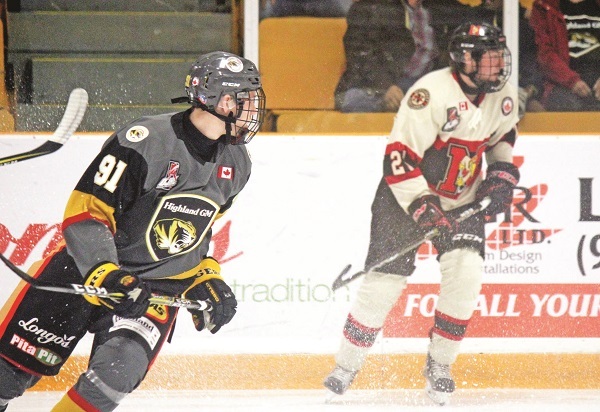 The Tigers clinched their playoff berth last weekend for the second straight year, despite being leapfrogged by the Newmarket Hurricanes in the extremely tight North division. The Hurricanes were the opponents in last Wednesday’s afternoon matinee, the third-to-last meeting between the rival clubs on the OJHL calendar. Riding a hot three-game winning streak heading into puck drop, the Hurricanes made sure it was never a close one in notching four straight before the Tigers could even get on the board, taking a 4 – 0 lead into the second intermission. Mauro Biasutto and Jack Varga each scored for the Tigers in the third period to bring the deficit to two, though it was as close as they got in completing the comeback. It was Biasutto who provided the game-winning goal in a steady rebound for the cats on Thursday, who went on the road for a 4 – 2 win to retake second place in the division. Lucas Durante was solid between the pipes in stopping 32 of the 34 shots he saw, while captain Steve McLean, Brock Hill, and Tyler Davis also found the back of the net. The ping-ponging continued when the Hurricanes beat the Spirit on Saturday, while a loss to the Toronto Jr. Canadiens for the Tigers on Sunday kept the standings intact by weekend’s end. Aurora’s Jacob Ball traded goals with Toronto’s David Sherman in the second period, a 1 – 1 score that held into overtime, where Sherman sent the Jr. Canadien’s 32nd shot of the game past Durante for the win. The Hurricanes (22-17-2-5) sit just one point up on the Tigers (23-19-2-2) and one point back of the Markham Royals (23-17-2-4), each with 46 games played and with seven left on the regular season schedule. Four playoff spots have already been claimed in the NorthWest division, with the lone West division position owned by the Oakville Blades, who lead the league with 80 points and only five regulation losses all season. The Tigers will be looking to make a push back to the top of the North in an upcoming five-game home swing, the last of the regular season, and where they have had the most trouble all year in putting together just a 10-10-1-1 record. Next up is a Friday evening hosting of the Whitby Fury, who are still in a hunt for a playoff spot in the East division. Puck drop is set for 7:30p.m at the Aurora Community Centre. They close out the weekend at the Den on Saturday in a rematch with the Hurricanes. The season closes out February 22 in Markham.